Bronte Capital: Did Mike Tyson ring a bell? Did Mike Tyson ring a bell? 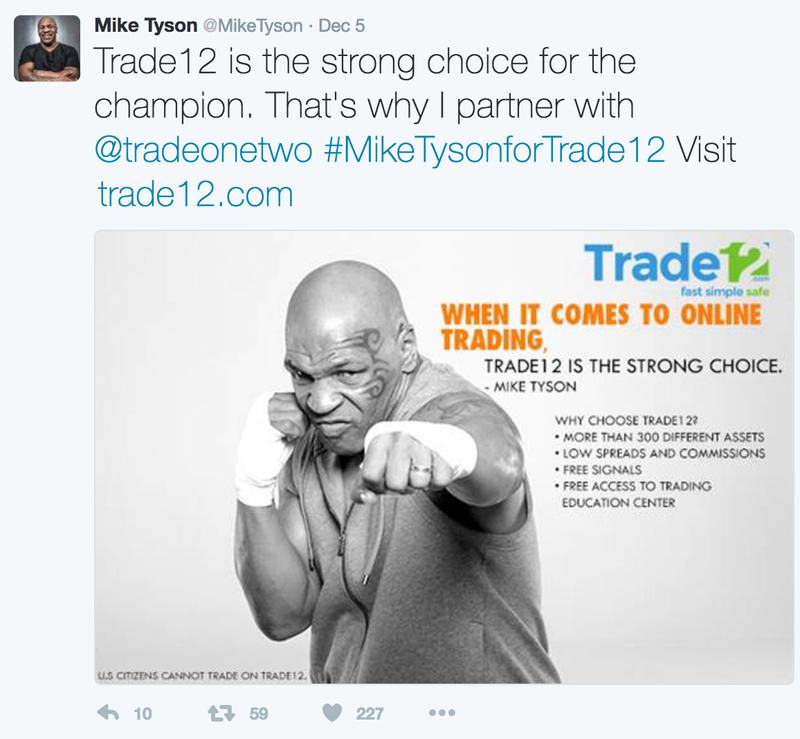 It's Mike Tyson promoting online trading platform Trade12. What can you say? I wouldn't like to step anywhere near a ring with Iron Mike - but I would love him as a counter-party. Trade12 is a bit of a black box. It is - and I am not exaggerating, owned and operated by an Estonian subsidiary of a Marshall Island company and regulated by a private company in Vanuatu. And according to its literature it does not solicit and accept clients from USA and France. Which brings me back to Iron Mike Tyson. He is - I gather - a US citizen. Either he trades with Trade12 (which would be illegal) or Trade12 is not "the strong choice of a champion". I suspect the latter - in which case my fantasy of trading against Mike Tyson is - well - just a fantasy. I'm shocked that a celebrity endorser does not actually use the product! I thought that the Federal Trade Commission forbade celebrity advertising when the celebrity did not in fact use the product? Although I suppose Mr. Tyson may be able to trade through an offshore entity, or other vehicle not readily available to the average frustrated US resident.